More than 2,600 miles away in Balch Hall, Scripps president Lara Tiedens, along with students, faculty, and staff, had been quietly doing just that. And they were ready to take action. According to the Bureau of Labor Statistics, the demand for workers with skills in computation is expected to grow 19 percent by 2026— a rate that will outpace those projected for all other occupations. Mindful of this trend, students across the country from diverse majors are eager to learn CS skills in order to gain a competitive edge in the job market. At Scripps alone, the number of CS majors has almost quadrupled over the past few years. 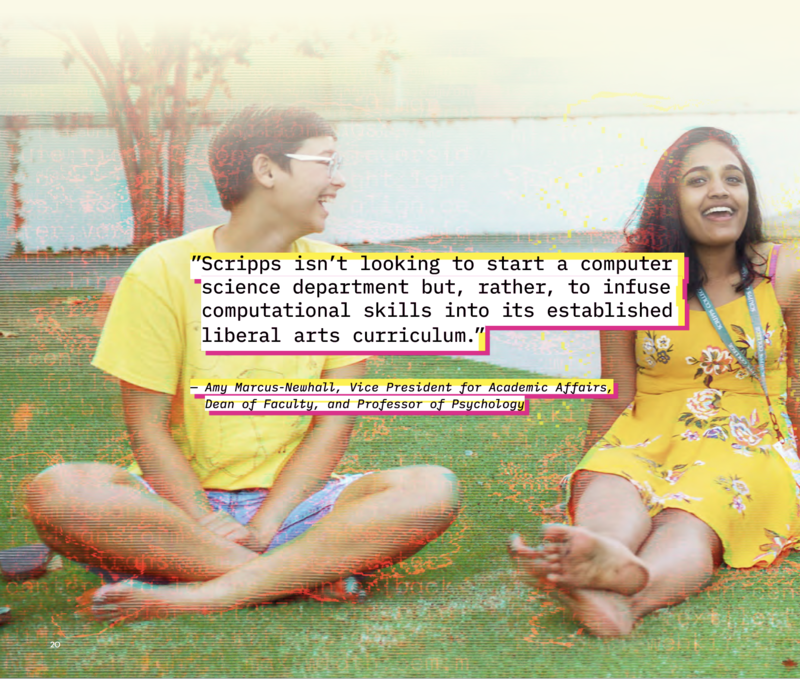 Scripps students interested in majoring in CS have done so as off-campus majors at Harvey Mudd or Pomona College, as the other three Claremont colleges— Claremont McKenna, Pitzer, and Scripps— do not have CS departments. This, combined with increased student interest in the field, has resulted in overdemand and overcrowding, and not every student who is interested in learning CS skills has access to training. During the 2017–18 academic year, the Faculty Executive Committee, the curricular policy body of the College, agreed that Scripps needed to do more to meet students’ needs for computational training. Around the same time, President Tiedens was drafting the College’s new strategic plan, which includes a pillar devoted to a renewed emphasis on being an innovative learning organization (ILO). An ILO “theme team” composed of faculty, students, and staff concurred with the faculty committee’s recommendation to strengthen the school’s computational capacity. Understanding that computational skills touch everything from traffic lights to health records to literary and musical archives, the team generated a series of initiatives intended to strengthen Scripps’ ability to train students in those skills. Yet, as Amy Marcus-Newhall, vice president for academic affairs, dean of faculty, and professor of psychology, explains it, Scripps isn’t looking to start a computer science department but, rather, to infuse computational skills into its established liberal arts curriculum. “Our students are more and more interested in computer science, but they are coming to learn those skills within a humanities background— within the framework of the interdisciplinary humanities core, the arts and letters. They are drawn here because of Scripps’ specific approach to thinking,” she says. To address that niche, the College is exploring a range of strategies, including hosting visiting faculty, scholars- and professionals-in-residence, lectures, and more on campus. “Women in tech fields are underrepresented— this is a fact. Much research has gone into understanding why this is the case, and theories range from basic sexism to the learning approaches and teaching methods used in those fields to how power and authority are distributed in society,” explains President Tiedens. Indeed, in 2017, information technology was rated among the worst industries for women in terms of recruitment and retention, with women making up just five percent of senior executives in the business, according to Douglas M. Branson, author of The Future of Tech Is Female. In 2017, when Nunna was sitting on a panel for students visiting the Googleplex, she met Kim Roberts, who heads up engineering education at the tech giant. “I learned that Robert’s division was beginning to seek out partner colleges and universities for their Applied Computing Series, and I immediately thought that Scripps would be a great fit,” she says. As Nunna tells it, when she broached the subject with Roberts, Scripps was already on the division’s radar due to earlier conversations between representatives at the company and the College’s administration. Fast forward to 2019: this semester, Scripps launched a course in partnership with Google, spearheaded by Associate Professor of Mathematics Winston Ou. The class, Introduction to Python and Data Analysis, will teach the foundations of computer and data science through hands-on, project-based coursework designed to attract students who might not be planning for careers in tech, but who want to develop the skill set to meet the ever-changing technology demands of the workforce. Scripps is currently one of only eight schools working with Google on the project. There will also be a 10-week machine learning summer intensive led by Google staff and local faculty in summer 2019. “We are really lucky to be working with Google. First, because on a fundamental level, we wouldn’t be able to do this without them, and second, because they are offering their considerable professional insight,” says Ou, who is teaching the course and the summer intensive. To prepare the instructors (all of whom are from disciplines outside of CS), Google held a training program in New York last summer modeled on a “flipped classroom” approach. The basic course content was delivered outside of the classroom, via an interactive online textbook, so that instructors could use their class time to tackle specific projects. Google wanted the instructors to experience the same teaching model that their CS pupils will enjoy: a largely self- guided exploration that empowers students to take ownership of their learning through trial and error. “Google’s idea is that people learn best in an atmosphere in which they are completely comfortable— in a setting where there is no shame. One of the ways this mindset is cultivated is by reframing the concept of ‘failure’ by creating an environment in which being stuck or making mistakes are not viewed negatively, but as crucial components of the process,” Ou continues. Ou knows, perhaps better than many, the importance of the classroom environment to learning. In his Core III class, Women and Math, students explore the cultural factors that lead to “math phobia” as well as the self-removal of women from many STEM fields. “We have read studies that show how women have higher standards for themselves: Where a female student will get a B in a course and think, ‘I clearly don’t get this, so I won’t continue pursuing the subject,’ a male student may say, ‘I did pretty well,’ and go on to the next course. Women cut themselves off from— and out of— certain fields inappropriately,” he says. Nationwide, there is a dearth of CS faculty, especially at liberal arts colleges. The stark reality is that people with PhDs in CS can command much higher salaries in industry than they can in academia. And at a liberal arts college like Scripps, creative thinking is key. In the quest to find even more opportunities for students to engage in computational thinking, Scripps is also partnering with Davidson College and other schools in an immersive program taking place this summer in the San Francisco Bay Area. Designed specifically for students majoring in the liberal arts, the program will teach computational thinking and software engineering geared toward solving problems within the humanities. “The program is about putting computer science and technology in a societal context and using critical thinking and critique as a mode for considering the role of technology in society,” says President Tiedens. In order to offer CS training regardless of the shortage of faculty, Scripps is on track to hire a faculty member who holds a PhD in a field other than CS, but who has an interdisciplinary track record of the computational, programming, and analytic expertise necessary to teach introductory computation courses to Scripps students (for an example of what this kind of teaching and scholarship looks like, see “The Science of Virtue” on page 30). This new endowed position was made possible by the Fletcher Jones Foundation Scholar in Computation grant in October 2018, along with a matching donation by Betsy Weinberg Smith ’74. “This is a first step in expanding faculty with computational expertise to teach classes that are in demand by our students,” says Marcus-Newhall.